The Mongol Empire is a reformable country in Asia. It can only be formed by the Golden Horde, the Ilkhanate or the Yuan which are also formable nations and have to be formed first. 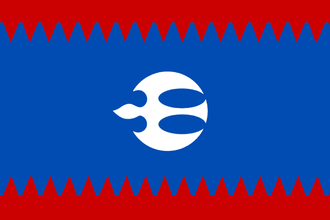 Reforming the Empire will also grant the forming country a unique government type, which is an upgrade from the Steppe nomad government type. The empire of Genghis Khan has fallen, broken into many parts. We must restore his legacy by replicating the Great Khan's conquests. We will reconquer the Mongol Empire! is Yuan, Golden Horde or Ilkhanate. is in the Altaic or Tatar culture group. 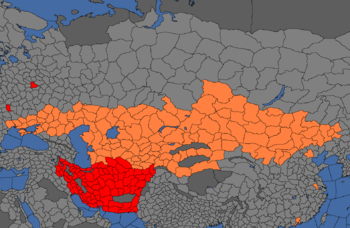 All colonized provinces in orange must be owned to form the Mongol Empire. Provinces in red must be owned or owned by a non-tributary subject. ↑ For the script code of the decision see in /Europa Universalis IV/decisions/MongolEmpire.txt. This page was last edited on 18 November 2018, at 17:22.